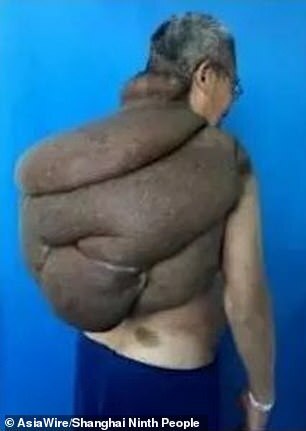 Shocking pictures show a 61lb (14.9kg) cancerous tumour that engulfed a man’s back. The 68-year-old, known only as Mr Tang, lived with the 85x65cm (33x25in) mass for more than 30 years. 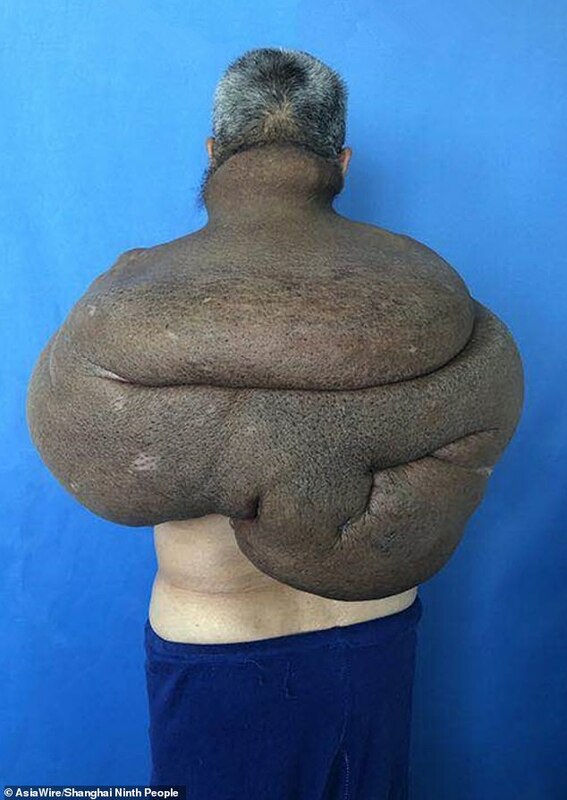 Desperate to have it removed, numerous hospitals refused to operate due to the tumour – which reports say ‘clung to his lungs, spine and major blood vessels’ – being too risky to treat. Mr Tang appealed to medics again when it caused a major blood vessel to rupture last year, which resulted in him nearly bleeding to death, local media states. A doctor finally agreed to help, with Mr Tang, who lives in China, going under the knife in a 33-hour operation on April 1. 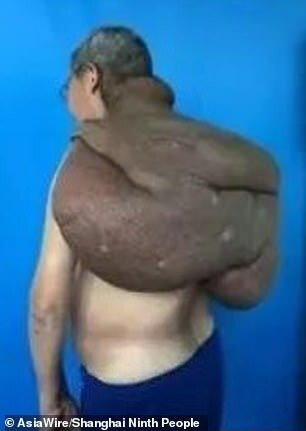 Despite him suffering major blood loss and being in a critical condition at numerous times, the procedure was a success. 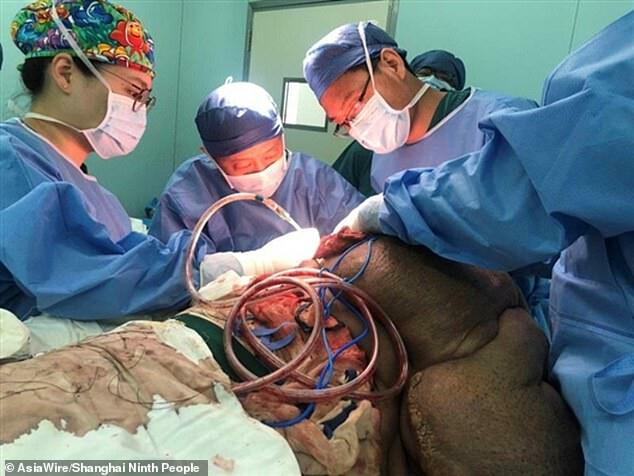 Mr Tang was finally operated on at the Ninth People’s Hospital of Shanghai. He turned to Dr Yang Jun, head of reconstructive surgery, for help on November 8 last year after his life-threatening health scare. The medic examined Mr Tang’s tumour, which revealed its size and weight, as well as the major organs and structures it was attached to. Nonetheless Dr Jun, who led the surgery, deemed him stable enough to go under the knife. Mr Tang suffered major blood loss during the procedure, which Dr Jun – who has successfully removed seven tumours – called ‘unavoidable’ due to the interconnected tissue between the mass and Mr Tang’s vital organs. Despite it being touch and go throughout, surgeons managed to remove the entire growth. They also covered Mr Tang’s wounds using healthy tissue from the surface of the tumour itself. The procedure reportedly took 33 hours to complete. It is unclear if the surgeons took turns to operate. Mr Tang was kept in intensive care for four days and was able to eat normally on day five. He was transferred out of intensive care on day six and can now walk as normal. Cancer cells initially stay within the body tissue from where they developed, for example the breast ducts. They then grow and divide to create more cells, which end up being a tumour. A tumour may contain millions of cancer cells. All body tissues are surrounded by a membrane that keeps its cells inside. If cancer cells break through this layer, the tumour is called invasive. As a tumour grows, its centre moves further away from the blood vessels in the area where it is growing. This causes the centre to have less oxygen and nutrients, which cancer cells cannot live without. They therefore send out signals, called angiogenic factors, that encourage new blood vessels into the tumour. Once a tumour has its own blood supply, it can rapidly expand by stimulating the growth of hundreds of new capillaries to bring it oxygen and nutrients. As it grows, the mass puts pressure on surrounding structures. But how it enters these tissues is not fully understood. One theory is it forces itself into normal tissue. This blocks blood vessels, which causes the healthy tissue to die and makes it easier for the cancer to continue to spread. Many cancers also contain high levels of enzymes that break down healthy cells and tissues. They also produce a mysterious substance, which growing research suggests stimulates them to move, however, this is unclear.